Toklat's Valena boots offer great protection at an affordable price. 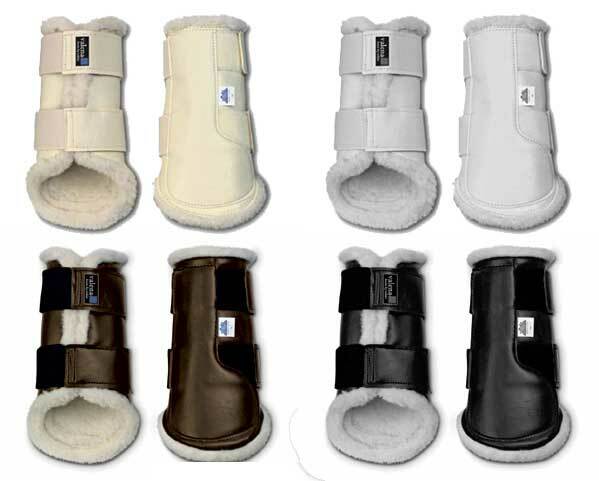 These hind horse boots feature heavy-duty vinyl outer that is flexible, with wide elastic, Velcro straps, and thick Woolback lining. The densely piled wool provides great shock absorption while also wicking moisture away from the leg. Fleece stays soft and fluffy, will not mat even after use and washings! Machine washable and dryable for easy care! Looks Great-wool does not soil as quickly as synthethics because the unique fiber structure resists dirt penetration. Care-machine washable and dryer safe.